A few months back, I went to a dinner event sponsored by Dove. The purpose of the dinner was to get to know the brand and the importance of moisturizing. I think I’ve already stressed before the importance of keeping your skin hydrated (click here to read all about it). Moisturizing is one of the many ways to do this. I’m not going to go into much detail about this but there a few things I feel everyone should know so let me share them with you real quick (huwag masyadong ma-excite sa giveaway! Read first! Knowledge is power! Haha!). So you have oily skin? Combination skin? So you think you don’t have to moisturize because you’ve got plenty of that? That’s where your wrong. One of the reasons why you secrete excess oil is precisely because your skin is over-compensating for the lack of water. When your skin is dehydrated, you tend to get oily. Your skin also ages faster and loses its glow. No amount of luminizers or primers or pick-me-uppers can cover that. Remember, healthy skin is the best canvas for make-up. Make-up is only good for enhancement. If you don’t have healthy skin to begin with, what’s there to enhance? Same goes for the rest of your body. 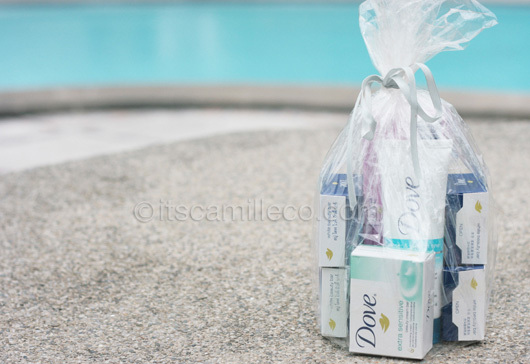 So here enters my blog giveaway, I’m giving away this Dove gift pack to 1 lucky winner. The gift pack includes 4 white beauty bars, 2 extra sensitive beauty cream bars, 2 pink beauty cream bars, 1 cleanser-and-toner-in-1, and 1 fresh touch facial cleanser. 2. Tell me a personal story about keeping your skin moisturized. It can be anything like an embarrassing moment because of dry skin, or a misconception about moisturizing you used to believe in, or what you do to moisturize your skin. Basically any personal story related to moisturizing. 3. Send me your stories below and don’t forget to include your Twitter and GFC username. Contest is only open to Philippine residents. Deadline for entries is on August 15, Monday at midnight. :) I will be choosing the best answers first and from there, Random.org will do the rest. Winner will be announced via my Twitter. And remember, cleanse, tone and MOISTURIZE!